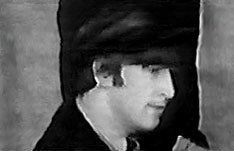 ABOUT THIS INTERVIEW: On Wednesday February 5th 1964, the Beatles returned to London Airport following a successful string of shows over 15 days at the Olympia Theatre in Paris, France. In this brief interview, filmed upon their airport arrival, the Beatles discussed their Paris experiences. While in Paris, the Beatles learned the news that they were finally number one in the American charts for the first time with the song 'I Want To Hold Your Hand.' Paul McCartney would later remember, "We got a telegram in the evening after one of the shows. We were having a drink at the hotel... so we all hit the roof." George Harrison remembered, "It was a great feeling because we were booked to go there directly after the Paris trip." The single 'I Want To Hold Your Hand' would remain the top song on the American Billboard charts for eleven straight weeks, only to be replaced by another Beatles song. The following conversation with the Beatles at London Airport took place just two days before the overwhelming and unprecedented hysteria of their first American visit. At the time of this interview, the Beatle haircut is still considered un-American. Q: "What was the reaction like in France?" GEORGE: "The audiences were a bit funny, you see. There were more boys than girls, and we missed the good old screams. But you know, there were quite alot of shouts." Q: "You mean they actually listened to you? That's the difference, is it?" Q: "What's the French electrical supply like over there?" PAUL: "It's good actually. Oh, the equipment's great. But on the first night, as you may know, we had a bit of trouble. Because we suddenly found there was a radio program just sort of plugging into everything, and it overloaded all the amps and everything. They just went, 'Boompf!'" Q: "What's the sort of stuff they like over there on the Hit Parade?" PAUL: "Umm, wilder stuff I think. We stuck in a wilder number to finish off with." JOHN: (jokingly) "'Gone With The Wind.'" Q: "They go for the Elvis Presley kind of stuff, there, do they? I mean, do they go for the older rock and roll stuff?" PAUL: "I think so, yeah, a bit more. It depended really who was in." Q: (to Ringo) "I hear that you are going to give us some poetry recitals." Q: "When's this? At the City of London Festival?" RINGO: "Yeah, yeah. (to the others) He knows, you see. It's a secret! Don't tell anybody!" RINGO: "Beethoven's. Remember him? Beethoven." Q: "Looking forward to this American trip, have you had any reaction over there? Have you got any fan clubs going as we speak?" RINGO: "Well, there's one supposed to be started and they're getting quite a good response, you know. (jokingly) Twelve thousand letters a day!" Q: "But the Beatle movement's going over there?" RINGO: "Yeah. (jokingly) So you needn't be a Beatle Booster, folks!"